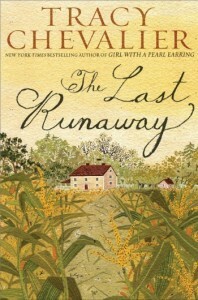 Win a hardcover copy of The Last Runaway by Tracy Chevalier! Please leave a comment below, and we’ll draw a name at random (Open to legal residents of Canada and the US, 18 years or older. Contest ends 15 February 2016 at 11:59 pm EST). Ohio 1850. For a modest English Quaker stranded far from home, life is a trial. Untethered from the moment she leaves England, fleeing personal disappointment, Honor Bright is forced by family tragedy to rely on strangers in an alien, untamed landscape. The men sweat and spit; the women drink whiskey and shoot copperheads, even as they stitch bonnets and quilts. Nineteenth-century America is practical, precarious, and scarred by the continuing injustice of slavery. In her new home, Honor discovers that principles count for little, even within a religious community famed for championing human equality. Drawn into the clandestine activities of the Underground Railroad, a network helping runaway slaves escape to freedom, Honor befriends two exceptional people who embody the startling power of defiance. Eventually she must decide if she too can act on what she believes in, whatever the personal costs. A powerful journey brimming with color and drama, The Last Runaway is Tracy Chevalier’s vivid exploration of an iconic chapter in American history.